The Brunette Baker is TWO! 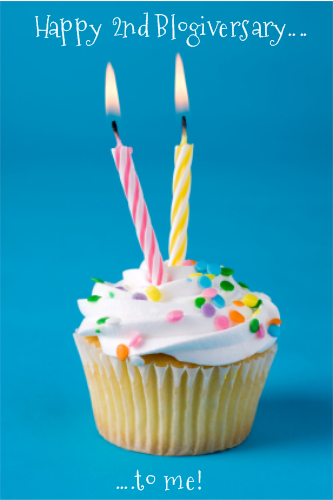 Today is my Two Year Blogiversary! Two, as in, 'I actually kept up with something longer than a few months'. One year ago, I didn't even think I would make it to my first, and here I am celebrating my second. I think I deserve a cookie at the very least. And some exploding confetti would be nice too. Just sayin'. Let me take you on my blogging journey. I won't make this a long story - at least I'll try hard not to. Okay, it probably will be long-winded. Feel free to grab a sandwich. I'll wait. Little did I know that when I started mine, it would grow into this crazy, passionate love affair. I started my blog the same reason many bloggers perhaps started theirs - to share recipes and talents. However, I really wanted to start a recipe journal for my kids with photos and step-by-step instructions on how to make the desserts we love; a way to share tips and techniques I've learned along the way. My mom has made some incredible creations over the years, but I can't tell you how many times I've asked her, "Show me this", or "How did you do that?" and she couldn't remember the little things she did to make something that was good into something truly fantastic. Unfortunately, I had ZERO confidence in my ability to blog when I began. I am not an overly confident person to begin, I suffer with anxiety on a daily basis; I very often use humour to deflect uncomfortable situations, so you can imagine I certainly didn't feel I was up to snuff with some of the other and already amazing bloggers out there. It can be pretty intimidating - like crazy intimidating. Could I really pull off a "Triple Decker Double Dark Chocolate Caramel Peanut Butter Pretzel Brownie Snickerdoodle Cookie Cheesecake Pie" (Oh my goodness - I wonder if I really could) and then photograph it to look like it should be in Gourmet magazine? The funny thing about that last statement, before the pie I mean, is that I'm not one to compare myself to others and I'm not someone who usually cares what others say, do, or think. I mean, I care, of course I care - I'm human, but I can't control what others say, do, and think - people will do that whether one likes it or not, but in saying that, I also knew that if anyone said anything bad or negative about my blog, especially coming right out of the gate with a hand mixer in one hand, a whisk in the other, and flour all over my face like war paint, I would be absolutely crushed; heartbroken. In fact, aside from three people, I didn't let anyone in on my dirty little secret. It took me almost 18 MONTHS to finally let people know I had a blog. Some were surprised, some were hurt, some even commented, 'It's about bloody time!". Looking back, it was clearly a self-preservation tactic that I perhaps took way too seriously. It finally took one of my cupcakes to be featured on a website for me to say, 'Wow, I can actually do this". A few weeks later, I received a lovely email from a sweet lady in Australia telling me she and her family had really enjoyed a recipe of mine. Wow. Australia? Really? Someone actually found me in Australia? The best email I've received thus far is someone telling me, "I don't bake, but I read your blog for just the stories. You're hilarious!" Damn right I am. (Okay, so I'm not the shy wallflower when it comes to my humour. I've had a lifetime of practice in that department to get it right. Remember, I am a middle child). I've become much more comfortable in my blogging skin since I began two years ago and found I'm not as bothered about what people have to say - or even think - about my blog. I mean, again, I care, but not in the same way. You either like me or you don't. That's life. I'm a big girl. I can handle it. If you've been thinking of starting a blog, I have two words for you. You don't need to have 8,010 Twitter followers or 16,478 Facebook fans to have a successful blog. Of course, it definitely helps if you're trying to get something more out of your blog than just having an outlet, but if your words, stories, thoughts, sports knowledge, fashion sense, or, yes, even recipes can brighten, enlighten, help, or educate just one person, then rest assured what you're blogging isn't in vain. Just don't get too caught up in what every other blogger is doing. Everyone's journey and reasoning is different - and there is always room for one more. Focus on YOU. The important thing for me is knowing that my kids will ultimately have a nice little collection of recipes under their belts, along with some tricks and tips to make something that once was good into something truly fantastic. The stories, I'm sure, are a nice touch. It shows them that Mom wasn't and isn't always perfect, but she is always good for a laugh. And she can make some mean chocolate chip cookies.